For many laptops, there are only a couple of things you can do to upgrade the hardware, upgrade the RAM and the storage. There are exceptions of course, there is the Alienware Area-51m which can be upgraded like a normal PC, or quite a lot of ultra portables has RAM soldered to the motherboard. With DDR4 prices plummeting recently, and both SSDs and NVME drives becoming affordable, now is a great time to give your aging laptop a little love with a nice upgrade. With RAM, nearly all laptops come with either 4GB or 8GB of RAM, looking on Currys, you will need to lay out over £1k before you get a laptop with 16GB or over £3k for one with 32GB of RAM. While Windows is better than it used to be for being a RAM hog, the same can't be said for other applications. If you use Google Chrome as your browser it will quickly chew through all your resources, if you have multiple tabs and extensions it will happily use up several gigabytes of memory. As I type this, it is using nearly 4GB, and I don't have much open. As I used Chrome a lot of work, with many tabs, it has forced me to upgrade to 32GB recently, and I am considering upgrading my laptop too. It is not just Chrome that needs RAM, lots of other applications will benefit from it, including gaming, video and photo editing. Most laptops in the last few years then your laptop should be using DDR4 RAM. To the best of my knowledge DDR4 launched on laptops with the 6th generation Skylake processors which launched in 2016. 5th generation Broadwell chips launched 2015 and before will likely be DDR3. The easiest way to tell is to get the processor number and look it up on Intel. Once you have confirmed you know the type of RAM you will want to decide what to get and how much. Most laptops have two slots for RAM, and if you open it up using the guide below, you should be able to idenitfy. If you are lucky just one slot will be taken and you can just double up by buying an additional module of RAM. Quite often, that is not the case, and you will have to replace all the RAM. You can always sell the old stuff online. Dependant on your usage, your requirements will be different. I personally think 8GB is the minimum for a smooth experience, 16GB is the sweet spot, and 32GB if you are feeling flush. Please note, laptop RAM is different to desktop RAM, it will normally have SODIMM in the name and is samller in dimensions. For the sake of clarity the two pictures below are laptop RAM compared to desktop. In general, it doesn't matter what bang you buy Corsair, Kingston HyperX, Crucial are all good choices. If you buy from Amazon, if it has a lot of decent reviews, you are good to go. RAM comes in different speeds, and for your average user, it will make no difference. DDR4 starts at 2133 MHz but the slightly faster 2400 Mhz stuff costs the same so you may as well get that. If there is only a tiny price difference between speeds then by all means, opt for the faster option. Some RAM will indicate the speed as MHz others MT/s. It means exactly the same thing. Do not worry about this, I was confused myself when looking at different options. A single-rank DIMM has one set of memory chips that are accessed while writing to or reading from the memory. A dual-rank DIMM is similar to having two single-rank DIMMs on the same module, with only one rank accessible at a time. Ranking primarily helps with increasing the overall density, so more RAM per module. Dual rank can have a small performance advantage over single rank (of up to 5% or more) in certain applications. There are no issues with dual rank in one channel (slot) and single rank in the other channel (which might happen with an original single rank module). Replacing single rank with dual rank probably isn't worth the money, since the typical performance gain is usually quite small. Even more important, choose dual channel (two modules) over single channel (one module) for best performance, a difference of up to 20% in certain appliations. How easy is it to install RAM? If your laptop can be upgraded, it is generally very easy to install the RAM. I always look at computers as really expensive Lego. Most of the components slot into place easily, and it is quite diffult to put things in the wrong way round or in the wrong slot. You will need to know if it is upgradable first, the easiest thing to do is look online for the model and upgrade instructions. Generally speaking, if it is not an ultraportable that is extremely thin and light, it is likely you will be able to upgrade. If the back of the laptop has lots of screws holding the back cover down then you almost certainly will be able to upgrade (with the occasional exception due to soldering). Some laptops will have a cut-out hatch, of varying sizes. Unscrewing this and opening will reveal some components that can be upgraded. Quite often this will be botht the RAM and storage. Some times there will be two hatches hiding one of each. To remove the memory module, push apart the clips holding it in place. The memory module should pop up at an angle. Then, holding the memory module by its edges. Try not to touch the gold connectors at the bottom, lift the module out. I have mis-handled RAM a lot over the years and never had any break on me, so you don't have to be too cautious, but at the same time, it is best to be quite careful. I often store old RAM loosly in drawers, and re-use it with no issues, so it is quite sturdy, not that I suggest this is a recommended way to treat your RAM. Similarly if you have one 8GB module you may as well double up with some Ballistix for £42.70. It is unlikely that one 8GB module would be installed. If you need to replace all your memory then I would strongly recommend going for getting 16GB so 2x8GB modules. This provides the best performance/cost ratio. By all means, go for 32GB but it costs quite a lot of money and I would say this is only worth it if you work on your laptop a lot in demanding applications. 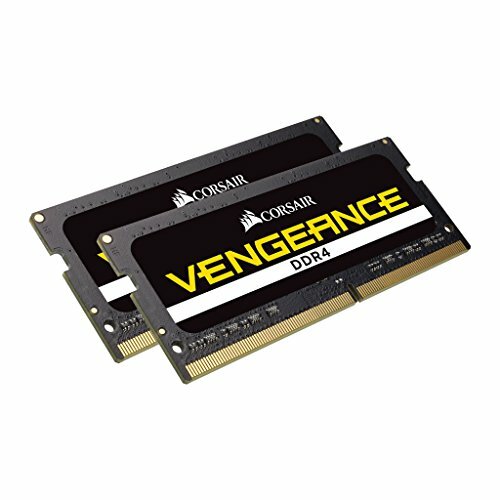 One of the best options is Corsair Vengeance 16 GB (2 x 8 GB) DDR4 2666 MHz at £89.99 – so this runs a little faster than normal memory, while I advised this was not necesary, the price difference was £2, so you may as well go a little faster. 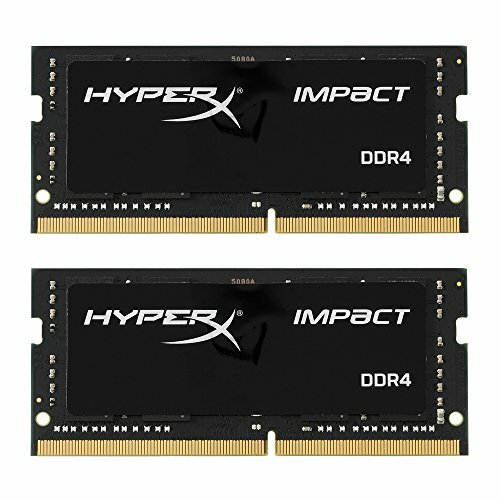 If you are feeling flush and have a need for 32GB of RAM then the Kingston Impact Notebook Memory 32 GB Kit (2 x 16 GB) 2400 MHz is a great buy at £148.49. As the prices change on Amazon a lot, the below table should update on semi regular intervals with the latest prices.